Tony, Sam, and the Stones Throw team was honored to recently brew a batch on our 7-barrel system with homebrewer Brian Hale. Brian was one of three "Best in Show" winners in this year's Best of the Bay homebrew competition held by the Bellingham Homebrewers Guild. Unsurprisingly, Brian is also currently the top-ranked seed in this year's "Washington State Homebrewer of the Year" competition. 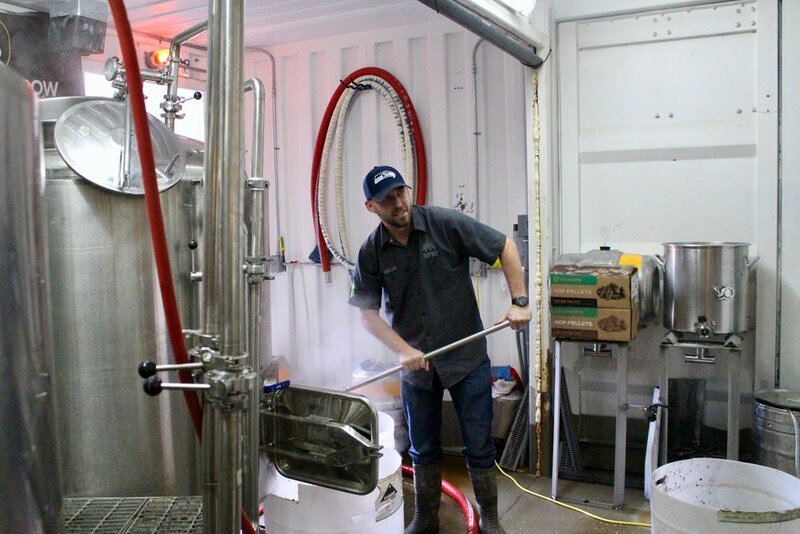 We collaborated with Brian to brew his Foreign Extra Stout, the "Late Night Delight." 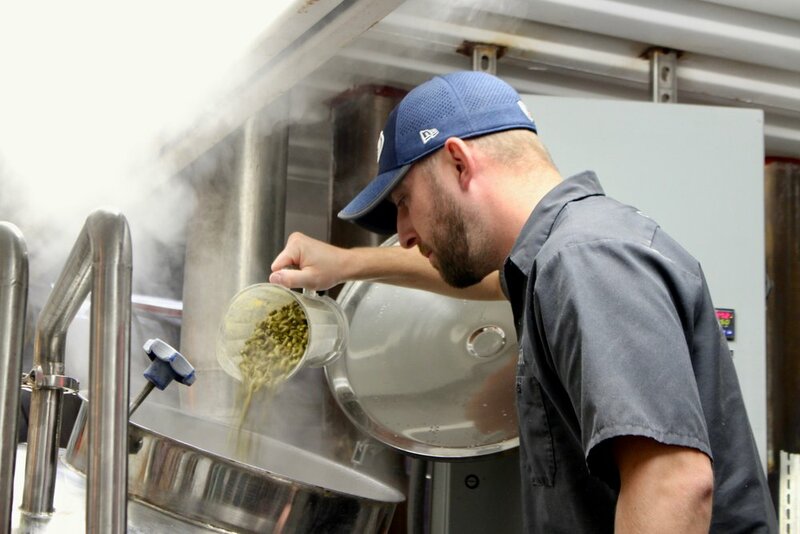 Get to know Brian before his delicious beer hits the Stones Throw taps in a few short weeks! How long have you been homebrewing, and how did you get started? I began brewing a couple of years ago after helping start up the Browns Point Homebrew Club. We meet a couple times a month at North 47 Brewery to share our homebrew with each other, talk about beer, and plan for upcoming homebrew competitions. The hobby has quickly become somewhat of an obsession! What is your favorite style to brew, and is it different than your favorite style to drink? I enjoy brewing styles that I'm not very familiar with. It forces me to learn the details about these styles, and in return I am rewarded with (usually) tasty beers! I'm gonna have to say that the "Late Night Delight" Foreign Extra Stout is definitely my favorite beer to drink! It's the recipe that I am most proud of for sure. Tell us about your "Late Night Delight" Foreign Extra Stout. I really enjoy the complexity of the grains in this beer and how they give off a smooth roasted chocolate smokey flavor. Drinking this beer makes me feel like I am camping in the woods by the lake at sunset, sitting next a nice big bonfire, hanging out with good friends and enjoying life! I have also brewed this recipe with some fresh raspberries and that version is extremely tasty as well! What are some of your favorite breweries? Obviously "Stones Throw Brewery" is my favorite place to drink beer and hang out! I also enjoy "North 47 Brewery" where I meet up a couple times a month with my homebrew club. Other than that, I really enjoy trying new places that I haven't been to before. We are very lucky here in the Northwest because there seems to be an endless amount of great breweries! I live in Tacoma and have 2 dogs and a beautiful girlfriend. Her favorite beer of mine so far is my "Late Night Delight" Stout, and she has requested that I make the Stout with Coconut next time! I got my college degree from Boise State University and was a kicker my freshman year on the football team. My company's website is www.OfficialTeamShop.com and we sell officially licensed Seahawks, Sounders, and Mariners merchandise.